The first time I saw a Mil Mi-24 Hind attack helicopter was at Forward Operating Base Ghazni, Afghanistan, in late 2008. I was an embedded journalist tagging along with a U.S. Army Black Hawk medevac crew, and as we waited on the ramp for our patient — a young private with a blasting cap injury who would be flown back to Bagram Airfield — a Polish Hind came in to land. “What is that?” I remember asking, transfixed by the strange and sinister aircraft on approach. I knew it was friendly, but the thing just looked mean, and I had a sudden inkling of how terrifying it must be to be on an attack helicopter’s receiving end. A decade later, I can definitively confirm that, yes, it is better to be in the cockpit of a Hind than outside looking up at one. 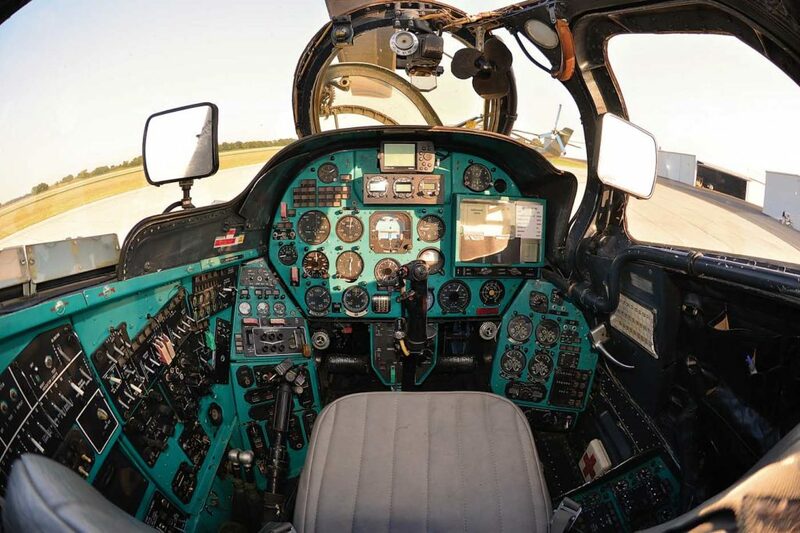 My chance to get behind the controls of this formidable Soviet-era aircraft came not in a war zone, but in Lancaster, Texas, in the form of a privately owned former Bulgarian Air Force Mi-24D. 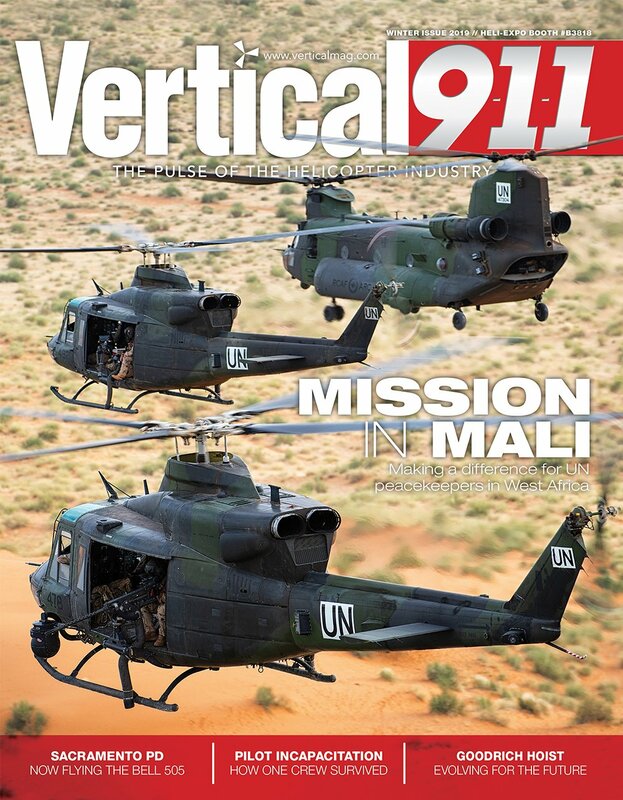 It is one of two flying Hinds that were associated with the Cold War Air Museum before that organization ceased operations at the end of 2017; you may have seen it on display at last year’s HAI Heli-Expo in Dallas. Recently, the owner of the Hinds has made them available for adversary orientation training for the U.S. military through a partnership with Tacoma, Washington-based VTS Aviation LLC (VTSA), and System Studies & Simulation (S3) Inc. out of Huntsville, Alabama. The training continues a legacy that started during the Cold War, when the U.S. Army operated Hinds as part of a classified exploitation program. To do that, however, first the Army had to learn how to fly them — without the benefit of an instructor or authorized flight manual. And, as I discovered for myself, the Mi-24 differs in some significant ways from the Western helicopter models that most of us are used to. The Mi-24 was designed under the direction of legendary Soviet aerospace engineer Mikhail Mil, and the prototype aircraft made its first flight in 1969, the year before Mil’s death. Derived from the Mil Mi-8 transport helicopter, the Mi-24 is unusually versatile for an attack platform, capable of carrying up to eight troops in its cabin in addition to the pilot and co-pilot/gunner (CPG) positions. 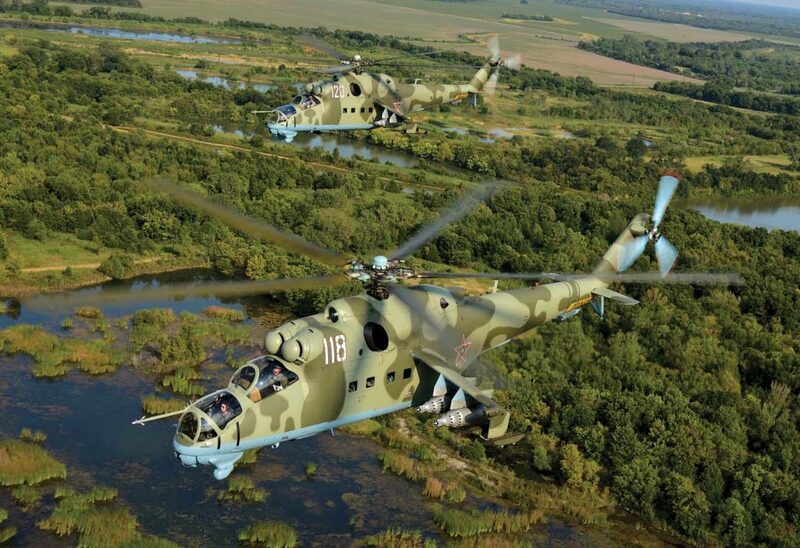 Over the past five decades, more than 40 variants of the Hind (the NATO reporting name for the Mi-24) have been operated by militaries around the world. The Mi-24D, which introduced the tandem cockpit configuration that is now typical of the series, entered production in 1973. It was succeeded later that decade by a closely related upgraded version, the Mi-24V (or Mi-35 in its export designation). 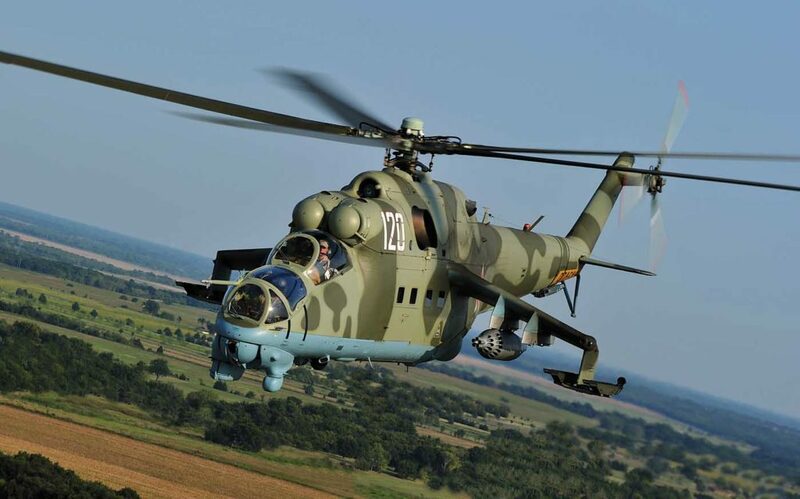 The basic Mi-24D model has a maximum takeoff weight of 11,800 kilograms (26,015 pounds) and is equipped with two Klimov TV3-117 engines, each delivering an impressive 2,200 shaft horsepower. That puts the Mi-24D in roughly the same category as the Sikorsky UH-60M Black Hawk, which has a max takeoff weight of 22,000 lbs (9,980 kg) and two GE T700-GE-701D engines rated at 2,000 shaft horsepower. cockpit but also by the anhedral, cantilever wings extending from the fuselage. The wings provide approximately 25 percent of the lift in forward flight, enabling fast dash speeds of up to 181 knots indicated airspeed. Additionally, the wings support up to three weapons stations per side, for a total payload of 1,500 kg (3,300 lbs) of external stores. 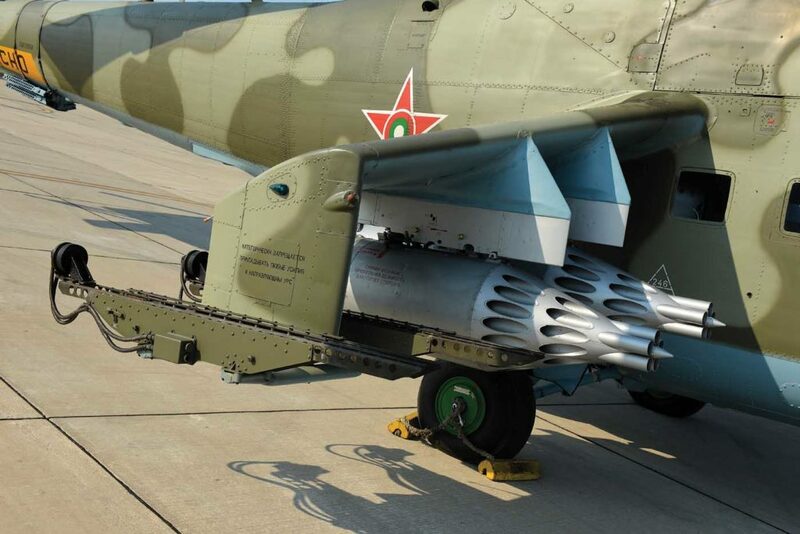 The Mi-24D can carry four 57-millimeter or 80-mm rocket pods (for a total of 128 smaller rockets, or 80 larger ones) and up to four AT-2 missiles. The aircraft is also capable of carrying most Russian bombs up to 500 kg (1,100 lbs) on its inner pylons. Up front, the Mi-24D is equipped with a four-barrel Yakushev-Borzov Yak-B 12.7-mm gun and electric gun turret. Defensive systems include an ASO-2V flare/chaff system, L-006LM radar detecting set, L-166V infrared (IR) jammer, and exhaust IR suppressors. 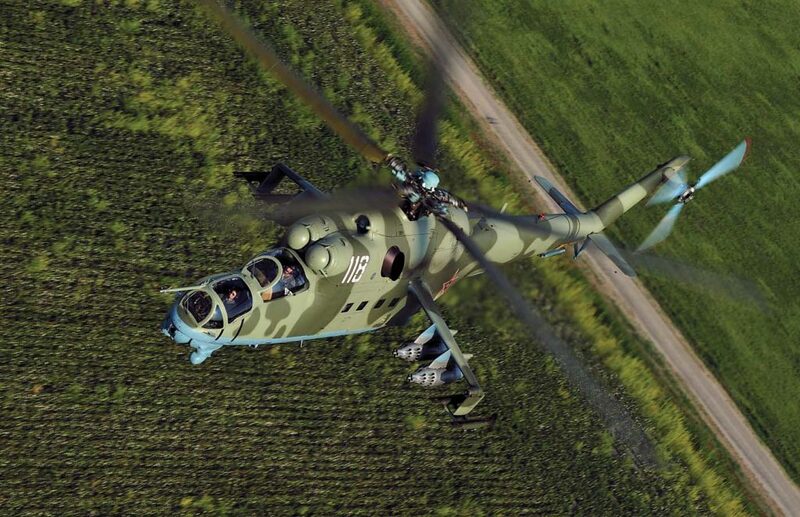 The Mi-24 follows the same general mechanical and aerodynamic principles as most Western helicopters: it has a conventional (albeit clockwise-rotating) main rotor and anti-torque tail rotor, as well as familiar cyclic, collective, and pedal controls. But it also has a number of design peculiarities that could catch Western pilots by surprise. Wait a minute, full left? I had flown helicopters with all manner of rotor systems — clockwise-rotating, counter-clockwise-rotating, tandem, and intermeshing — but never one in which full left was the closed throttle position. I realized that some of my deeply ingrained piloting reactions could be a liability in the Hind. Still, at least I would have an instructor pilot backing me up. That wasn’t the case for members of the Army’s Foreign Material Test Team, who in the 1980s had to figure out how to fly purloined Mi-8 and Mi-24 helicopters on their own. 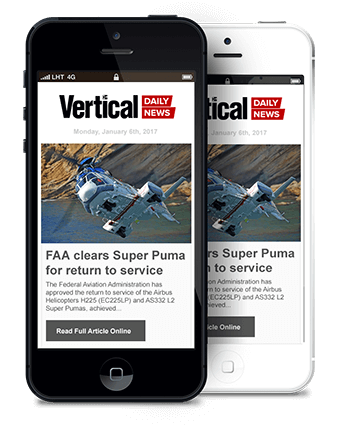 Among them were Jeff Stayton, who is now director of aviation systems for VTSA, and Steve Davidson, the company’s chief pilot and senior subject matter expert (who in 2014 was inducted into the Army Aviation Hall of Fame). I met both of them during my visit to Lancaster. gotten its hands on some stolen manuals, they independently validated every specification, flight limit, and maintenance procedure more than once — an effort that became the basis for the Army’s own manuals. As relations with Russia improved during the ’90s, the team began to communicate directly with the Mil Design Bureau, and “we were pleasantly surprised at how close our books were,” Stayton recalled. 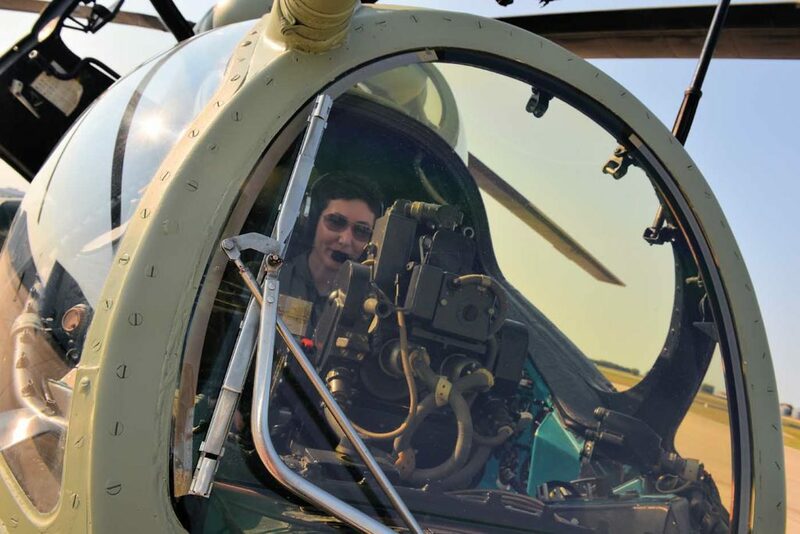 By the time the project was turned over to the TSMO in 2003, the Army had three flyable Hinds and a wealth of operational and performance data on the aircraft, which it used to inform its own aviation tactics. Those objectives — dispelling myths and informing better tactics — form the basis of the Mi-24D adversary orientation training that VTSA and S3 are offering to the military. A class of U.S. Air Force weapons officer undergraduates had gone through the training just a few days before my own visit to Lancaster, and Totty gave me a sample of what they had experienced in their ground and flight training. The pilot’s compartment is located above and behind the CPG compartment, and is accessed from the right side of the aircraft, whereas the CPG compartment is accessed from the left. This cockpit contains all of the instruments and controls necessary for piloting the aircraft in all phases of flight, plus PKV and S-17 weapons sights that are used for launching unguided rockets or firing the gun in the fixed forward position. The CPG compartment, where I would be spending my time, is primarily a weapons station, as the CPG has primary control of all armament systems except the unguided rockets and gun pods. Directly in front of the CPG seat — and occupying a significant amount of real estate — is a KPS-53AV gun/bomb sight, which is used to aim and fire the turret gun system and acquire targets for aerial bombing. The CPG also has a missile sight on the right side of the compartment. (Of course, there were no actual weapons on my Hind, so I wouldn’t be able to get too carried away). While the CPG compartment does have flight controls, these are mostly intended for emergency use. Normally, the cyclic is stowed forward and to the right, while the pedals are hidden in the sides of the compartment. When a trigger lever is squeezed on the CPG’s collective, hydraulic pressure moves the cyclic and pedals into the active positions. My cockpit orientation complete, Totty and I moved into the classroom for an overview of aircraft systems and performance. Adversary orientation training is not intended as a substitute for full pilot transition training, so Totty kept the emphasis on the Mi-24D’s strengths and weaknesses relative to the Western aircraft it might be flying against. However, the wings, which are prone to stalling, also limit the aircraft’s maneuverability. Rolling into a turn, the wings tend to continue the banking action and must be counteracted with lateral cyclic; beyond a certain angle of bank, that cyclic authority simply runs out. 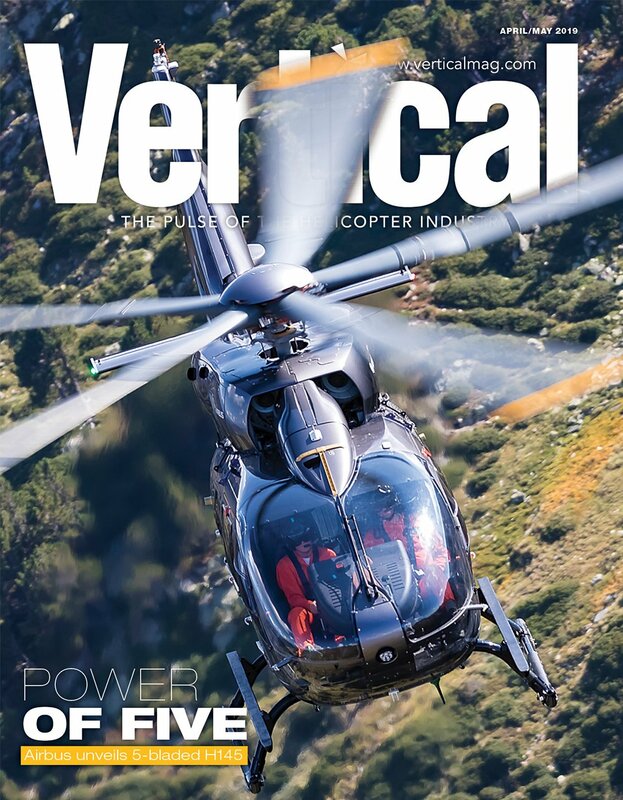 “From an agility standpoint, Western helicopters have an advantage,” Totty said. “A turning fight is not where the Hind pilot wants to be.” In the Mi-24D, the aircraft’s low-pressure hydraulics also impose constraints on maneuverability (a shortcoming that has been remedied in the latest Mi-24 models). Awe is certainly what I felt when we were standing on the ramp at the Lancaster Regional Airport, preparing for our flight. 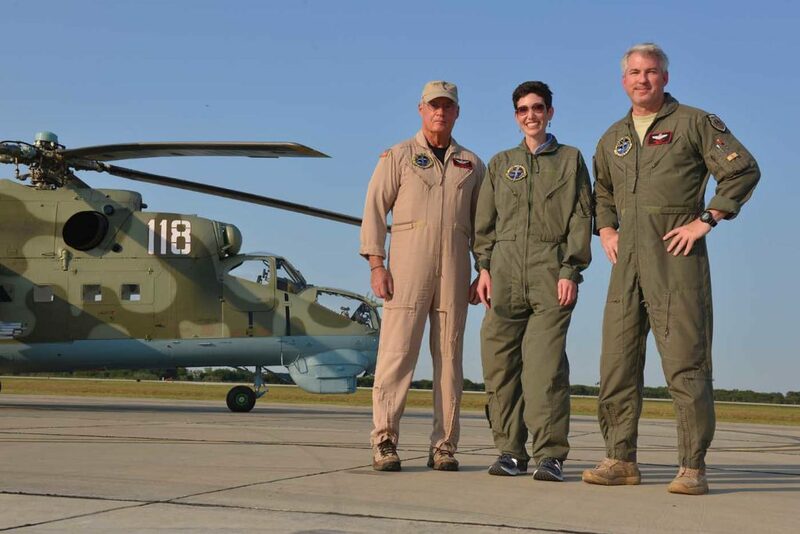 Totty and I would be flying in one Mi-24D, N118NX, while Davidson piloted a second Hind, N120NX (the helicopters are registered with the Federal Aviation Administration as experimental aircraft). 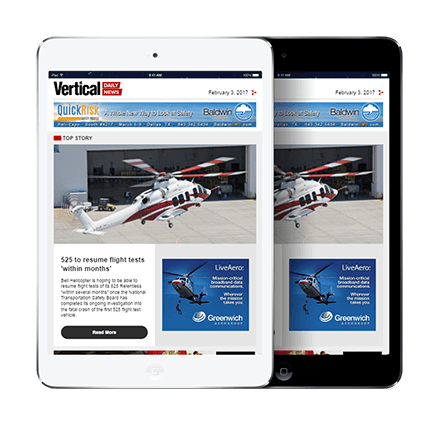 The plan was to take off and fly in formation for an air-to-air photo shoot, with Vertical 911 photographer Skip Robinson and Ken Pyatt of Sky Helicopters in a Robinson R44. Then, while Davidson and Pyatt’s aircraft continued the shoot, Totty and I would break away to give me the chance for some stick time. With no weapons to tend to, there wasn’t much for me to do in the CPG compartment during start-up, but Totty narrated his checklist for me. After setting the cockpit switches, he started the aircraft’s AI-9V APU, which is used to supply compressed air for starting the main engines. The main engine starting sequence is initiated by selecting the desired engine (left or right) and then pressing a “start” button on the panel. The air starter shuts off automatically when N1 RPM reaches 60 to 65 percent (or after 55 seconds if the start is unsuccessful). Totty had me activate my flight controls while we were still on the ground; the pedals and cyclic moved readily into position. When everything was set for takeoff, he ground taxied the helicopter to the runway for a rolling takeoff. Contrary to some lore, the Mi-24 can hover, although that’s not where it’s most comfortable. So we were up and away into forward flight as quickly as possible, settling on an airspeed at the upper end of what the R44 photo ship could handle, but below the Hind’s preferred 135-knot cruise speed. Our aircraft took the lead for the formation flight, which gave me the opportunity to witness first-hand something that Totty had mentioned in the classroom: the CPG’s very limited field of view. In combat, that means the CPG must rely on the pilot or wingman to call out threats. While the pilot’s cockpit has a larger field of view, it is partially obstructed on the right-hand side by the canopy design. That fact, combined with the clockwise rotation of the main rotor, means that Mi-24 pilots tend to break left, and position the flight lead on the left-hand side. Once we had completed the formation shots, Totty and I did, in fact, break left to return to the airport, where he handed the controls over to me for a few laps around the traffic pattern. The pilot and CPG cyclic controls in the Mi-24 incorporate a force trim system, which took me a while to feel out. Likewise, it took some effort to stay on top of the pedals when transitioning out of forward flight, particularly since the CPG’s controls aren’t designed for ergonomic comfort. Still, I performed a couple of patterns to rolling landings without too much concern. The Mi-24 may have its quirks, but it still flies like a helicopter. Sadly, we had to wrap things up there for a very typical reason: we were running low on fuel. The Mi-24D has an average fuel burn rate of around 1,600 lbs (725 kg) per hour, giving the standard aircraft an endurance of roughly two hours with reserves. It’s the ideal helicopter for flying from one fuel refinery to another. Although I didn’t want the flight to end, I climbed out of the aircraft with a huge grin on my face. According to Totty, that reaction is typical of the U.S. service members who complete adversary orientation training in the aircraft. “They all love it,” he said. And who wouldn’t? 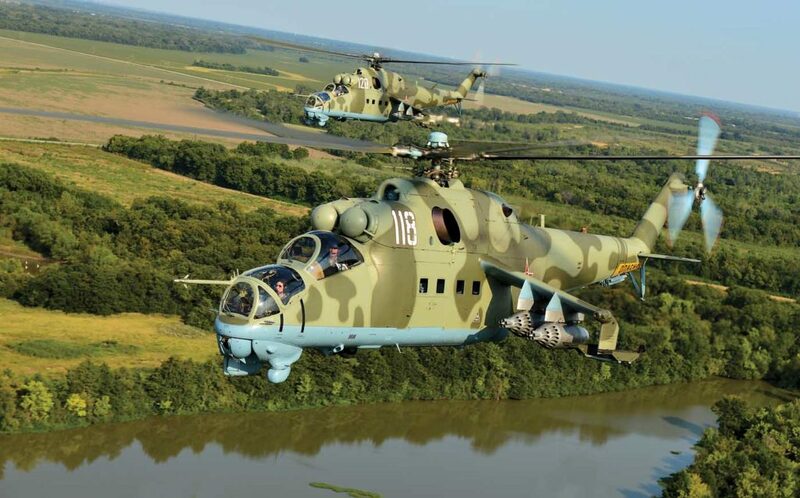 The Mi-24 is a remarkable helicopter that relatively few people have the privilege to fly, the global distribution of the model notwithstanding. For those of us in Western countries, its mystique is even greater. And if you’re going to come face-to-face with a Hind, it’s far better to do it on your own terms than have your first encounter on the battlefield. Yes great to get more info on the hind, I have been woken up a few times in the past by loud noise of a hind trying to scare us, first couple of times they did. Nice article about the flying experience. Got a couple new insights for it like the assault rifles swings in the windows for shooting. As I thought that you just supported the gun for portholes, but that swing does lot of sense to deny the accident that someone shoots at your rotor or wings when gets excited by action. As well the information how the CPG cyclic and pedals were positioned away if not activated with that handle. I heard as well about that myth of uncapable for hovering years back and I was dazed by that how it would be possible as you can often see it to hover. But then I got to know that there was many stories for that reason. India and Pakistan both fly Mi-24 and does mountain border patrols with them. And the pilots learn to recognize the other side pilots and they like to do these “mirroring” tasks where other side does something and you need to mirror the other actions. And one time the other went to hover and dropped to vortex and dropped down like a stone in thin air at mountain altitude. And then became the rule that you are not allowed to fly below 100km/h (53kts). One other story was that in Afghanistan the Mi-24 were used to transport infantry in the full combat weight and at 4000m altitude you couldn’t hover in full weight for a take-off in safe manner because high cross-winds. So what they did was just use a rolling take-off by getting little speed and then rolling over the cliff to get up in the air without trouble from cross-winds. The other mystical things about these attack helicopters are about their armor. 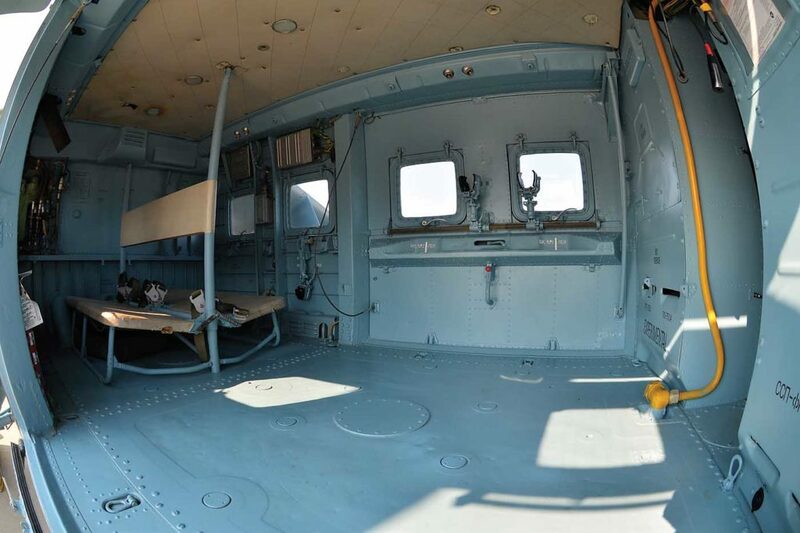 Like with Mi-24 the only armored glass is the portholes as the flat windshield. So the bubble canopy is not armored. The same thing is with the AH-64 Apache that side windows are not armored but just the front flat windshield. Same was with AH-1 that had the flat canopy that frontal part was armored. That is something that makes KA-50 and Mi-28 special ones that the whole cockpit is armored against 23mm HEI-T shot from 5m distance and against a 12.7mm AP ammunition to fuselage and 7.62mm AP for windshields from point blank. There is this combat flight simulator called “DCS World” and it is excellent for military aircrafts (many modules used by the military for training purposes etc) and there is coming the Mi-24P maybe at 2018-2019. And that means it will be amazing to get hands on that variant. As one thing that I would like to know is how the targeting system works in Mi-24. As the targeting sight is a periscope from the BRDM-2 or something, just set upside down and it makes it little odd to use as it is on the side instead front of you but as it gives capability to fly max 60 degree angle to target, it should be fairly effective to get little maneuvering capability.